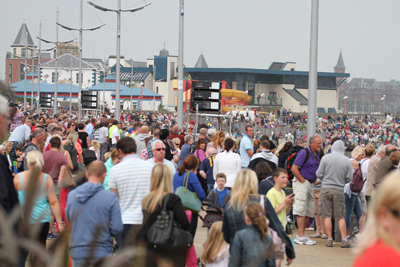 THE B/E Festival of Flight in Newcastle proved to be another outright success with tens of thousands of visitors descending on the seaside town for another bumper packed festival. Now in its third year the Festival of Flight adopted an American theme to celebrate the 70th anniversary of the arrival of the GI’s to Newcastle and this was embraced by the local business community who created great window displays and dressed in themed costumes to entertain the estimated 80,000 visitors. On Friday 10 August U105 hosted their ever popular Frank Mitchell morning show and the afternoon drive with John Daly provided a platform to talk about the festival and the Mourne Destination and as Newcastle filled with expectant festival goers the arrival of the Typhoon for a practice of its anticipated display was a wonderful added event into the schedule and a taster of what was to come! Organisers and sponsors and get set for the Festival of Flight 2012 in Newcastle. In the driving seat is Down District Council Chairperson Mickey Coogan with US Consulate General Gregory Burton. Before the displays got off the ground the US Consul, Gregory Burton, paid the Newcastle resort a visit to celebrate the American link. He called into the Slieve Donard Resort and Spa and was greeted by Down District Council Chairperson, Councilor Mickey Coogan who began by welcoming Gregory Burton, his wife Nana Lee and staff of the US Consulate to Newcastle and thanked them for their contribution to the festival. He said, “The programme of events wouldn’t be possible without the financial support of our headline sponsor B/E Aerospace in Kilkeel and I welcome Alan Henning B/E Aerospace Director and his colleagues to Newcastle. Their contribution for the 2nd year has been instrumental in the continued development of the Festival of Flight and we look forward to strengthening this partnership. “Also, I would like to give a huge thanks to the 100+ members of the emergency and voluntary services who assisted in the planning and delivery of the Festival of Flight this weekend and we must also pay tribute to the efforts of the Newcastle Chamber and many independent businesses across the Newcastle area who have contributed financially and ‘in kind’ and who are entertaining. 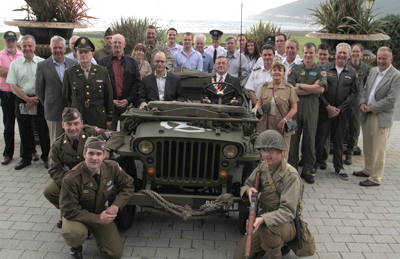 A fantastic photo opportunity availed with the arrival of the American Dodge jeep and the GI crew from the Wartime Living History Association. While this was happening, the Newcastle Library welcomed back a visit by Ulster Aviation Society and its display of the US American Air Forces presence in Northern Ireland during WW11 which was enjoyed by many visitors. CHECK OUT 80 PHOTOS FROM THE FESTIVAL OF FLIGHT IN NEWCASTLE. An added addition this year was the presence of the Military Vehicle Displays by UMVC and Model Aircraft Display by UMAC in Donard Park and thousands of visitors enjoyed investigating the past history through stories, memorabilia and re-enactments, not forgetting the large range of military vehicles on display which created fantastic interest among all the spectators, young and old alike. From noon to dusk the promenade was brought alive with U105 Roadshow and the many American themed street entertainers who wove their way through the thronged promenade. Maurice Jay, Julian Simmons, David Johnson and all their roadshow crew hosted much of the entertainment including the Junior Glees performance and a special rendition of Lakme’s The Flower Duet by Bronagh McKillick and Carol-Anne McKay which had the crowds mesmerised! Fun and games prevailed and an amazing performance by James Huish of ‘Mack the Knife’ gave a glimpse of his performance to come. 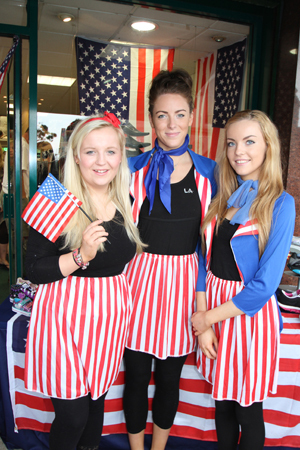 Getting into the GI swing are Jaclyn Kelly with Laura and Dannielle Lambe at McCready’s Shoes in Newcastle. Although the weather was warm, the hazy conditions were not ideal for full height displays and all display teams had to perform flat line displays, but the crowds were delighted none the less. The first into the Bay was the locally built Tucano as it twisted and twirled in front of the crowds gathered along the promenade. The Irish Air Corps with their three shop Pilatus PC9’s were a welcome return to our festival and the added commentary from Colonel Gerry O’Sullivan, Irish Civil Defence was a special addition to their normal display scheme. This was swiftly followed by the aptly named ‘Smoking Cow’ with its fresian paintwork and smoking plumes, ‘Gerry O’ was a moo-ving sight in the sky as he waived to everyone on his final approach. Flight Director, Jeff Salter and Flight Commentator Angelo Cunningham had arranged for all the displays to flow in quick succession to keep everyone engaged throughout the airshow. Their chat and commentary provided much background information and interesting facts about all the aircraft, pilots and their manoeuvres. Next on the flight schedule was iconic WW11 Supermarine Spitfire. It was an evocative sight and the sound of it’s merlin engine much surely have brought back memories for many. Pilot, Peter Tiechman put the beautiful plane through its paces as he swooped low across the bay in front of his appreciative audience. As he disappeared from view we were greeted by the arrival of Europe’s most spectacular civilian display team, The Aerostars who provided a 15 minutes of amazing aerobatics in their Russian YAK’s and made great use of their easily visible plumes. All of this was just the warm up to the speed and sound of the fast jet section, the first of which was the RAF Hawk who increased the speed and agility of his aircraft to the delight of the crowds. Miss Demeanour arrived aka Hasker Hunter in her iconic colourful livery. Built in the 1950’s but well ahead of her time she looked beautiful and with deafening roar she produced one of sights of the afternoon! The finale was without doubt, the colossus, the Typhoon! Eight minutes of high octane display. The aircraft thundered into Dundrum Bay to the absolute pleasure of everyone who witnessed it. Death defying manoeuvres were accompanied by high velocity and high volume after-burners. The skilled Typhoon crew performed such dazzling aerobatics that it was no wonder it was the festival highlight. As it blazed out of our natural amphitheatre the stage was being prepared for an evening of swing by James Huish and his band performing evening from Buble to Sinatra. Ninety minutes of non-stop hits keep the crowds entertained and they enjoyed the evening sunshine. U105 closed show with an up tempo mix of modern pop by RIO (Debbie & Glen Bradley) who had everyone dancing and singing along. As the festival came to a close many thousands of visitors remained to enjoy the local hospitality in the numerous restaurants, bars and clubs. Plans are already afoot for a ‘spectacular’ in 2013! Over 80,000 people watched the Festival of Flight in Newcastle.